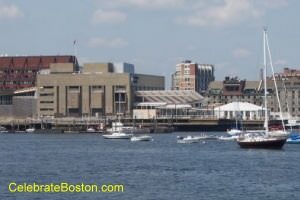 The New England Aquarium has been a popular attraction for many years, and is a traditional field-trip destination for many primary schools in the Boston area. The children are fascinated by the giant ocean fish tank that is a simulation of a coral reef, and enjoy educational and interactive presentations by the staff. The giant salt-water fish tank occupies the center of the building. A pathway wraps around the tank and allows the visitor to follow some of the exotic fish as they swim around the tank in a circle. One can follow a large shark or sea turtle around the tank, or relax next to a pane at the bottom of the vessel and study the smaller species that collect there. The fish in the giant tank are fed several times a day, and it is amazing to watch the divers in full scuba gear submerge into the tank and hand-feed some of the species (especially the sharks via a lengthy stick). Also very popular is the penguin exhibit. There is a large open pool on the lower floor of the aquarium, and many penguins gather together in groups on faux rocks, or swiftly swim about in the pool. The penguins are hand-fed twice per day, and the visitor can watch from the railing above as the staff feeds each penguin individually, while also maintaining a checklist of which animals were fed. The aquarium has many smaller tanks that simulate varying marine environments, including a Boston Harbor Salt Marsh, Pacific Reef, Florida Swamp, a Brazilian Jungle Rivulet, etc. There are exotic species available for viewing, including venomous Lion Fish and infamous Piranha. Outside the aquarium is an open seal tank that is usually the first or last stop when visiting the aquarium. A guide and map is available at the entrance. Within it is a schedule with all the presentations for the day. There are interactive live animal presentations in a special gallery room that is very popular with children, and informative presentations at the top of the tank that allows visitors to ask questions and learn about marine life or about the aquarium. There is a Simons Imax Theater adjacent to the aquarium, where three-dimensional films are presented with topics relative to nature themes and other fascinated subjects. The mission of the New England Aquarium is to increase understanding of aquatic life and environments, to enable people to act to conserve the world of water, and to provide leadership for the preservation and sustainable use of aquatic resources. The Aquarium is an organization with honorable and worthy goals, while also educating its visitors and making the experience interactive and fun for all ages. Walking Directions: Exit the station and walk east toward the ocean. The aquarium is located to the right of the large red brick Marriott Long Wharf Hotel building.